Boutique server memory maker Netlist has embiggened its HyperCloud DDR3 memory sticks to 32GB, ganging up cheap and low-capacity DDR3 memory chips with a register and virtual memory controller that allows the HyperCloud memory to break out of server memory constraints and do so with cheaper chips. To get an edge in the memory racket, Netlist cooked up a way to backstep one generation on memory chips and double them up using a two-sided board packaging technique called Planar-X. So Netlist could make an 8GB memory stick based on 1Gb DDR3 chips from Hynix Semiconductor that was only somewhere between 20 and 30 per cent more expensive than a standard 4GB stick using normal packaging. The upshot is that fatter HyperCloud memory is cheaper than standard memory for a given capacity. But that's not all you get. The HyperCloud memory is about more than packaging. Each module has two ASICs. The first is a register device that presents four physical ranks of memory as two virtual ones to the memory controller on an x64, RISC, or Itanium processor. So the register lies to the memory controller and therefore allows for the doubling-up of memory modules per channel. The other ASIC is an isolation device that makes four memory slots look like one as far as the memory controllers and memory bandwidth are concerned, allowing for main memory to run at the full 1.33GHz speed, even on a current two-socket, 18 slot Xeon system that is fully populated. Obviously this can have a dramatic effect on the performance of the system where memory capacity and speed are important for the workloads. The memory controllers on the Xeon 5500 and 5600 processors from Intel have a cap of 800MT/sec, which means on fat memory configurations the clock speed has to come down to 800MHz instead of 1.33GHz. The Netlist HyperCloud memory's register and isolation ASICs allow you to get around these capacity limits and therefore double up the capacity above the specs for your server. The operating system sees the extra memory as real memory – you don't have to do any funky swapping to use it. Paul Duran, director of business development at Netlist, tells El Reg that the company has sold more than $1m in HyperCloud memory sticks with 8GB and 16GB capacities, primarily on Xeon 5600 servers that have 50 per cent more cores than the Xeon 5500s but no increase in memory capacity. The 32GB HyperCloud memory will be based on 4Gb memory chips from multiple suppliers, and they will compete with traditional DDR3 memory sticks based on 8Gb memory chips that may only end up being manufactured by Samsung Electronics and therefore not be subject to pricing competition. Netlist is hoping that this turns out to be the case because it will crack the server memory market wide open for Netlist memory, which has been certified by server maker Super Micro and motherboard makers Tyan and Gigabyte. Netlist plans to sample the 32GB HyperCloud memory to OEM partners in December and the plan is to get it qualified and shipping in the second half of 2012. 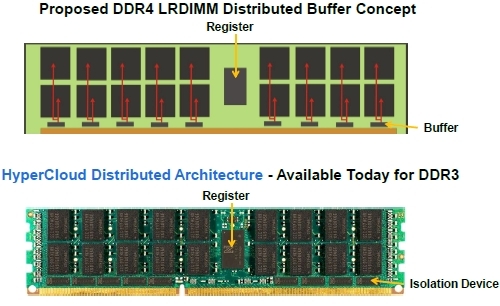 It sure looks like the proposed DDR4 LRDIMM distributed buffer memory module borrows some ideas from Netlist. The JEDEC Solid State Technology Association announced the key attributes of the DDR4 main memory spec back in August. The DDR4 spec has not yet been finalized and it is not expected to be published until mid-2012. But the techies at JEDEC clearly recognize that having a single memory buffer at the center of the DIMM is a big bottleneck and that the added capacitance from the long traces to reach that buffer and then fan back out to the pins on the memory module reduces the signal, and hence you need to run memory slower. The HyperCloud approach puts the register at the heart of the DIMM and puts multiple smaller buffers (what Netlist calls an isolation device) on chunks of memory, which pass straight down to the pins, yielding shorter traces and straighter paths into and out of memory chips. "We're certainly pleased that the DDR4 memory standard is moving in our direction," says Duran.